Successful business concepts today generally involve entirely new ways of thinking. In the world of computer software and mobile apps, the terminology is known as disruptive technology, and it refers to the fact that nothing really new or transformative comes from simply applying a new coat of paint or polish to something old and familiar. In a broad sense, the personal computer and the cell phone were among the greatest disruptors of recent time. If you go back in time, other ground-breakers included the friction match, the printing press, the incandescent light bulb, the internal combustion engine, film, radio, television, and so on. Certainly, some of these inventions evolved over time rather than instantly bursting onto the scene. Television, for example, gradually evolved from radio to the flat-screen displays of today. From the dozen local VHF channels of the early years, came UHF adapters, cable, and satellite systems that now bring hundreds of programming options into the home of any subscriber. 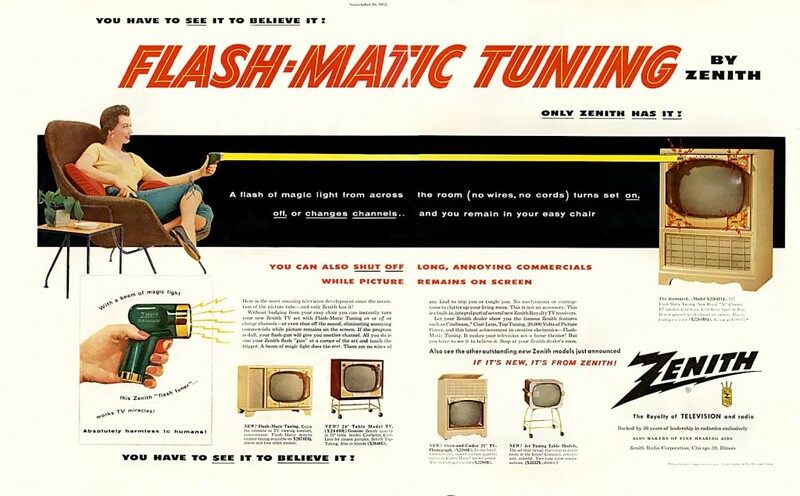 Even the remote control has evolved by leaps and bounds from the original Zenith Flash-Matic, introduced in 1955, to the programmable, multi-function devices of today. I remember a very primitive one-button remote control on my family’s Sylvania console TV back in the 1960s. We could not watch TV during a thunderstorm because lightning made the remote control go crazy, endlessly changing the channels on the motorized tuner! Disruptive ideas are far from limited to the technology industries. In the customer service industries, we need to think less like our grandparents and more like our next generation of customers. For campground owners, this means thinking outside the box, seeking out the next new idea that will appeal to your guests. When was the last time you invested in a major piece of new recreational equipment? Not simply a new playground, but things like a fitness course, canine agility park, jumping pillow, gem mining station, laser tag, or spray park. And when is the last time that you really shook up your activities schedule, adding an event or two that will run the risk of being ahead of its time but that could also prove to be overwhelmingly popular? There are a couple businesses in New Jersey that fall under the “who wudda thunk it?” head-scratcher concept category. Stumpy’s Hatchet House was founded in 2015. Its first location, in Eatontown, was the first indoor hatchet-throwing facility in the United States, probably a lot more fun than either bowling or darts. Customers pay $40.00 per person for a two-hour session that includes safety training, a lesson, hatchet rental, and use of a hatchet pit. A separate party room can be rented by groups, or the entire venue can be rented for $1,500.00 per hour (up from $1,000.00 a year ago.) Spectators (referred to as “non-throwers”) pay a cover charge of $15.00 each. Stumpy’s is opening 3 more locations in June 2018, with a total of 12 locations soon to be in operation in 7 states. Located in West Berlin, New Jersey, Diggerland USA is the first and only construction themed adventure park in North America, where children and families can drive, ride and operate actual heavy construction machinery. The park covers about 21 acres and is comprised of over 25 attractions, the majority of which are real, diesel powered, full size, pieces of construction equipment. Guests who visit Diggerland USA can drive full size backhoes, dig giant holes with real excavators, and operate just about every sort of construction machine you might imagine. Guests pay $129.00 for a one-hour package operating one machine, $258.00 for a two-hour package operating two machines, $387.00 for a three-hour package operating three machines, and an extra $395.00 to smash a car. There are also group packages and special adult sessions called Diggerland XL, designed for adults over the age of 18 and including more unrestricted equipment operation. Both of these businesses fall under the umbrella category of the adult fun industry. Time will tell whether these ventures will take off and succeed in the long run, but most service businesses today are not planning where they will be 50 years from now. Serial entrepreneurs work within a far shorter time-frame (typically 10 years) within which to take risks, hopefully profit, move on to the next venture, and sell to a new investor. When you come right down to it, how many campgrounds are not currently for sale, given the right price and circumstances, along with a ready and willing buyer? A park that embraces concepts on the cutting edge (no hatchet-throwing or excavator puns intended) will profit in the short run and tremendously increase its value in the long run. I recently heard about a business in New Jersey that was founded in 2015, has apparently been successful, and is one of those “who wudda thunk it?” head-scratcher concepts. Stumpy’s Hatchet House is difficult to explain, but if falls under the umbrella category of the adult fun industry. It is the first indoor hatchet-throwing facility in the United States, probably a lot more fun than either bowling or darts. Customers pay $40.00 per person for a two-hour session that includes safety training, a lesson, hatchet rental, and use of a hatchet pit. A separate party room can be rented by groups for $100.00 for a two-hour session, or the entire venue can be rented for $1,000.00 per hour. Spectators (referred to as “non-throwers”) pay a cover charge of $15.00 each. When I visited their website in December, Stumpy’s was taking reservations for a New Year’s Eve hatchet-throwing buffet and seeking out inquiries from prospective franchisees. Time will tell whether this venture will take off and succeed in the long run, but most service business today are not planning where they will be 50 years from now. Serial entrepreneurs work within a far shorter time-frame (typically 10 years) within which to take risks, hopefully profit, move on to the next venture, and sell to a new investor. When you come right down to it, how many campgrounds are not currently for sale, given the right price and circumstances, along with a ready and willing buyer? A park that embraces concepts on the cutting edge (no hatchet-throwing pun intended) will profit in the short run and tremendously increase its value in the long run. Give this thinking a new level of commitment as we head into a new year. � Pelland Advertising. All rights reserved.